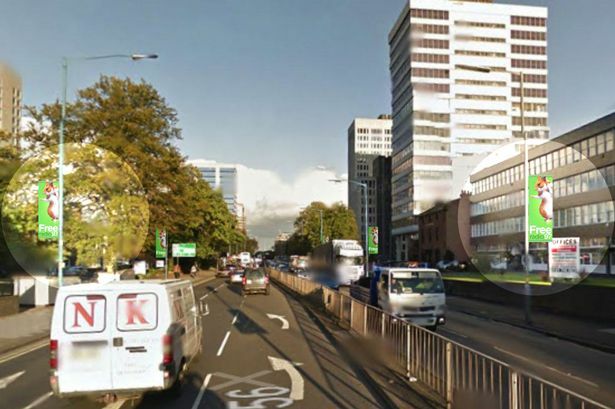 City leaders have been accused of making Birmingham&apos;s streets look tawdry and tatty after plans to line major commuter routes with money-spinning banner adverts were approved. The ads will be draped from lampposts lining 21 main roads, including Hagley Road, Coventry Road and Belgrave Middleway. Senior Labour councillors believe the eye-catching banners could generate income for the cash-strapped city council during this time of cuts. But opposition Tories claimed the advertising will make the city&apos;s streets look cheap and tawdry. Coun Bob Beauchamp (Cons, Erdington) said: "These are an abomination. They are going to go all over the city. "We already have flags on Aldridge Road in Perry Barr and they always look tatty. It makes the city look like one big car showroom." Planning committee members also raised concerns that adverts were carefully vetted to ensure no unsuitable products or anything which might cheapen the city&apos;s image were used. The banners won enthusiastic support from Labour councillors who believe they will provide valuable income. Coun Barry Henley (Lab, Brandwood) said: "This is good quality advertising and should provide a good quality return for the city council." Last year, the city council controversially struck a deal with advertising firm Signature Oudoor which has placed electronic billboards on major roadside sites, including the ICC link bridge over Broad Street. The relationship took a turn for the worse in March this year though when Signature Outdoor was denied planning permission to erect hoardings. That advertising is expected to raise £1.3 million per year for the council. Income figures for the new lamppost advertising have not yet been revealed.